There’s so much to be said for the classy and tasteful appearance of engraved wood. As decoration or jewelry, it can mesh with so many styles and aesthetics, from sophisticated to funky, and offers a lovely natural touch to any look. Frederick Engravings carries a great array of custom engravings fantastic for gifts and equally meaningful if you purchase them for yourself. Engravings are a unique, creative, and personalized way to commemorate and cherish events or celebrations, and our experience in this business means we’ve learned to accommodate so many different styles and customer desires. All our wood is laser-engraved for the best durability and precision available. 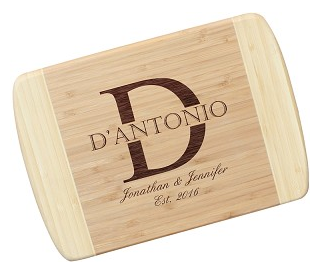 From jewelry to home decor to kitchenware, we have such a beautiful selection of engraved wood creations that you’re bound to find the perfect gift during your search. It’s not hard to find the ideal engraved gifts for your loved ones with our array of exciting options available to you. If you’re looking for a unique present for those supporting you as you get married, monogrammed hangers for your wedding party’s wardrobe on your special day are a great choice. For someone who loves to cook and share meals, we carry beautiful customizable bamboo cutting boards and serving spoons and forks to bring some quality and personality to any kitchen. Jewelry is a classic gift for any anniversary, graduation, or another special occasion. Our beautiful monogrammed wood cufflinks are a great touch for any suit wearer, and we sell monogrammed necklaces, and earrings in multiple styles, both engravings and cutouts. Take a look at the beer and wine openers in rosewood or maple that can be enhanced with custom engravings for a creative and handy housewarming, holiday, or birthday gift. We even have engraved hammers you can personalize with a special message to the person who does the repair work around the house, and engraved golf tees for those who like to spend a day on the green. Our selection of engraved wood is extensive, comes from quality materials, and is created with care. There’s no end to the possibilities with Frederick Engravings, so get shopping!